I recently came across an article on the Design Sponge blog that caught my attention. 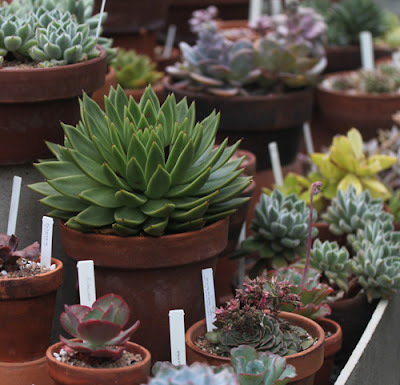 It was about succulents/cacti and how to incorporate them into your design plans. I have always loved the massive variety of cacti that exists in the world. So many colors, textures and leaf patterns - it's like design school in nature. I've owned several varieties of cacti over the years (and sadly don't have most of them anymore). It's tricky living in the Southeastern United States. We have scorching summers (that often start in Spring) and winter is unpredictable. A frost over night can ruin the best made plans of any typical gardener - not to mention the crops of local farmers. Having a cactus garden has always been a dream of mine. Possibly having a greenhouse will make the dream a reality. I'm always intrigued to see how other people display their plants. Some are placed in typical clay pots, letting the plant garner all of the attention, while others are in placed complimentary pots. 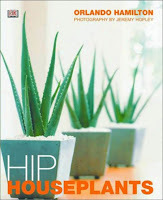 A few years ago I found a book at a local book sale entitled, "Hip Houseplants". The author is a former florist who now styles flowers/plants for top clients. The book was published in 2001 but I was able to find it listed on the Amazon and Barnes & Noble sites. I was lucky enough to get this gem for a mere 50 cents or a dollar. I suggest looking for a pre-owned copy and save a few bucks. (I never pay full price for anything.) It's one of my favorite books and I highly recommend it. It's full of helpful hints, ideas and care of plants in only 144 pages (including the table of contents). Next time you're in a home improvement store, take a trip into the garden section and look at the selection of succulents and cactus they have on display. If you have a sunny spot in your home, a cactus might be interesting to you. They are low maintenance and super cool. Until next time - Happy Plant Hunting and as always, contact me with any questions.